Normally I would just send floating point numbers as strings and parse them on the receiving end, but sending them as raw binary means much smaller messages, so I thought I’d see if I could help to find a solution. Towards the end of the day I managed to have a look back and there was a comment from the original poster saying that the sample didn’t work. At that point I decided to write a simple little testcase. First up quick little Java app to generate the messages. This now gave an answer of 3.141592653589793 which looked a lot better. I still think there may be a cleaner way to do with using a DataView object, but that’s enough for a Friday night. This better fits the original question in that it will decode an arbitrary length array of doubles and since we know that Java is big endian, we can set the little endian flag to false to get the right conversion without having to re-order the array as we copy it into the buffer (which I’m pretty sure wouldn’t have worked for more than one value). 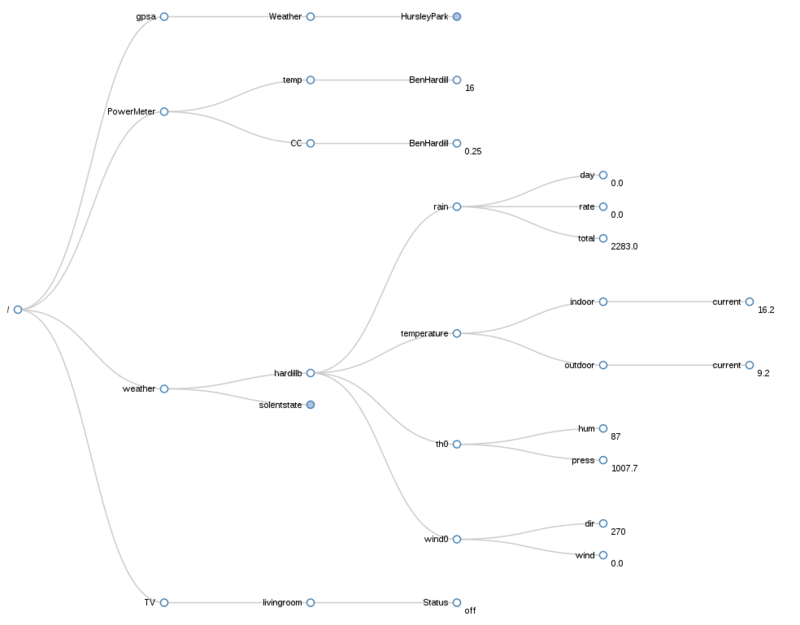 I’ve been having a bit of a play updating my d3 based MQTT topic tree visualiser this weekend. I’ve been trying to tidy things up a bit and break the code out into a little standalone library and only leave the MQTT connection code in the index.html. I’ve been improving the handling of long payload. There is now a nicer popup tooltip with a longer version of the payload, it’s still cropped at 100 chars but I’m still working on wrapping it and showing a few lines to get more in. I’ve been moving the MQTT connection code over to use binary WebSocket connections* rather than the JSON based proxy I was using before. The version hosted here is still using the proxy for now, but the binary versions work and I’ll move it over once I’ve finished playing with my internal broker setup. I still need to try and make the whole thing resize or at least not have hard coded dimensions, but that might have to wait for next time. I’ve stuck the updated version up here, I’ll stick the code up on github once I get sign off from the boss. As part of writing my talks for the developerWorks Days Zurich conference next week I’ve been working on some code for the demo in the MQTT session. I was looking for a nice way to display a MQTT topic structure and the most recent value posted to topic. In the past I have used a plugin to the freemind mindmap tool that plots the topics as and their values. This worked well but it does require a machine with Java and a very old version of freemind to make it work so it was time to see if there was another approach. Starting with the d3 Collapsible Tree Layout example seamed like a good idea and it didn’t take too long to tweak it a little to make it dynamically add new topic branches when a message was received. I also swapped out the where the data was loaded to use a static root rather than loading it from a json file on the server. This worked pretty well so next I set about looking to see if I could add the payload of the message. To do this I added a data field to the json object for each node when populating the tree. Then updated where the SVG is inserted to add a text element in the right place. // Transition nodes to their new position. Again this worked very well, except that it would not update the payload value after adding the first version. I tried a number of things to get this to work, but didn’t get very far, until James Thomas pointed me at this page about how some of the internals of d3 work. It talks about entry, update and exit methods to work on new, existing and removed elements in the data. There are examples of entry and exit functions in the example so I tried adding an update method but kept getting errors that it wasn’t found. I went back and had another look at the examples in the page James had linked to and noticed that update code doesn’t actually use a functions. An that was basically it. I’ve added a bit more code to update values when the tree branches are collapsed and to trim payloads to no more than 20 chars so the display is not too cluttered. I’m planning on improving the style sheet a little soon and possibly adding an effect so you see which payloads have been updated recently and maybe add hover text with the full payload for the shortened ones.